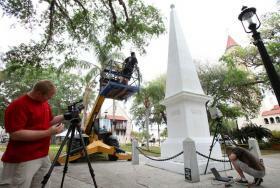 The City of St. Augustine and Master Craftsman Studios brought Chris Ellis, FSU alum and former MCS employee, over from California to scan the monument to the Spanish Constitution. MCS was initially contacted by Pres. Sandy D’Alemberte and Allison Defoor to help get the project moving.